"I’m telling you why we broke up, Ed. I’m writing it in this letter, the whole truth of why it happened." Min Green and Ed Slaterton are breaking up, so Min is writing Ed a letter and giving him a box. Inside the box is why they broke up. Two bottle caps, a movie ticket, a folded note, a box of matches, a protractor, books, a toy truck, a pair of ugly earrings, a comb from a motel room, and every other item collected over the course of a giddy, intimate, heartbreaking relationship. Item after item is illustrated and accounted for, and then the box, like a girlfriend, will be dumped. 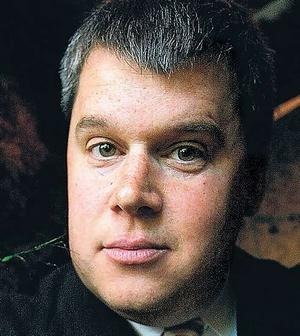 You may or may not know that Daniel Handler is the real-life name of Lemony Snicket, who wrote the Series of Unfortunate Events books some time ago. If you’re at all familiar with this, do not read this book expecting another quirky children’s tale. I’ve seen a review or two that complains about this very thing, which leads me to believe that some readers don’t understand that using a pseudonym for the silly books was the whole point. His other work isn’t silly, isn’t bizarre, and isn’t anything like the SoUE books. But that doesn’t make it any less wonderful. 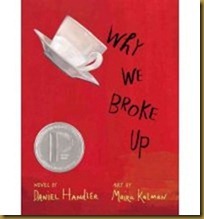 This is probably a "love it or hate it" kind of book. The story itself is written in the form of a "Dear John" letter (that’s a breakup letter, for you young’uns) by the protagonist, and the writing style shifts between journal/letter/stream-of-consciousness depending on just how angry Min (the main character) is about whatever she’s writing about. Her letter to Ed lists all the reasons why they broke up, recounting events and conversations and snippets of memory that led to this moment in time where her pen hits the paper to tell him they’re done. The writing is vivid, rough, and raw at times. There’s nothing overly sweet or sentimental here, and the dialogue is stilted but not faked, awkward but not forced, and true to life. This is how teenagers talk: Full of uncertainties, playing to the moment, and highly reactionary. Min’s own insecurities come through very clearly in her letter. Throughout the story, she recounts how Ed and others always call her "different" and "strange" (but in a good way), but she doesn’t see it that way, and fights against this label because she believes herself to be truly average if not a little bit worse. It’s heartbreaking at times, but also more telling than some of us might like to admit — I think most of us struggled with teenage insecurities, and Min’s anger and frustration (and moments of joy, memories now tainted with the heartache of knowing what was to come) will, undoubtedly, strike a chord with many readers, even those who are long past their teenage years. Daniel Handler is the author of the bestselling A Series of Unfortunate Events (under the pen name of Lemony Snicket), a collection of books for children, and three books for adults: Basic Eight (based on a true story of a teenaged girl who commits murder), Watch Your Mouth (a melodramatic satire of family life), and Adverbs, due out this year. This entry was posted on Thursday, April 26th, 2012 at 2:55 pm	and is filed under Tasty Tomes. You can follow any responses to this entry through the RSS 2.0 feed. Both comments and pings are currently closed.